What can you do if you're overqualified for a job, but still want to apply? When the job market is slow, there may be a shortage of jobs for which you are qualified, and it can make sense to expand your job search. Even when unemployment is low, you might have personal reasons that make a lateral or downward move seem appealing. For example, you might be starting a family or want a shorter commute. But regardless of why you want the position, if you appear overqualified for a job, you'll need to carefully craft a cover letter so that your application will be considered. Employers are notorious for discarding overqualified candidates. That's because they're afraid that the person will be bored or unmotivated and might move on to another job in short order. Employers are most eager to hire people who will stay with the company for a while, since it’s expensive to hire, train, and onboard new employees. If your work experience or education could make you appear overqualified, it's important to construct your cover letter and resume to counteract the perception that you'll be unhappy in the position and only in it for a short period. A key factor in getting your cover letter noticed is to highlight any similar jobs you have held even if the position was not your most recent. You will need to point out why those comparable jobs were satisfying and successful experiences for you. This will show potential employers that despite being overqualified, you don't necessarily plan to move on to a more challenging role in the near future. For example, take the case of someone who is applying for a sales assistant job, but has worked most recently as an account manager or salesperson. If they have had enjoyable jobs as an assistant in the past and excelled in that role, it will be critical to highlight those experiences. You can also consider acknowledging that you are overqualified for the position, and explaining why you're still interested. Being honest, and not letting your qualifications become the elephant in the interview room, can be helpful. 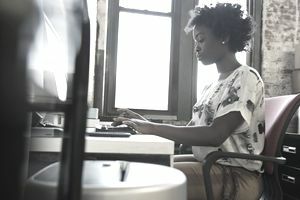 In the example above, the candidate might point out that she prefers organization and detail to persuasion, and then focus on her successes as a sales assistant. As much as possible in your letter, seek to assuage potential employer concerns about how long you'd be with the company. If you've always been at jobs for several years, for instance, you can mention your loyalty and that you are eager for a long-term relationship with your next employer. A one-size-fits-all cover letter will not do in this instance. If you appear overqualified in your resume, use your cover letter to make it clear why you are actually a good match for the position. For example, maybe your experience at some high-level positions will still help and inform your day-to-day work in the current position (or can be an add-on that you provide). It will be critical to analyze the skills, interests, and assets that an individual would need to possess in order to excel in the target role. Then, in your cover letter, use concrete examples to show how you possess these assets and have achieved success in past jobs, volunteer work, or course projects. Finding the right job will require you to know how to write a targeted cover letter and how to match your qualifications for a job. If you're unsure of where to start writing a cover letter, using an example cover letter from your industry or based on your level of experience is a great place to start. During your interview, be prepared to answer questions about being overqualified — as in your cover letter, use this as an opportunity to tell a story that shows you're a candidate who plans to stick around in the position long-term. Follow-up communications after the interview should show enthusiasm for the actual content of the job. If possible, ask a former colleague who supervised you in a similar role to make an unsolicited recommendation call (or send an email) to decision-makers. Having a clear strategy about how to follow up after your interviews is important, so plan one out before you walk into the meeting. When possible, adjust your follow-up to include details from your interview itself. Showing your enthusiasm for the role will help convince the interviewer that this isn't a desperate measure and that you really do want the job. The unsolicited recommendation call or email will also demonstrate your interest in the role. It's easy to be overlooked when you're overqualified for a position but by putting a little extra effort into your application, you can show the interviewer that your interest is sincere and not fleeting or desperate. Even today, in my current job as Executive Assistant to the Director at ABC Corp, I have a Pocket Herb Garden and an Abracadabra Abacus on my desk. I’d love to come to work every day and know that I was using my skills and experience in support of products I love. I’m confident that my skills and passion for your products and company make me a good choice for this role. I’m happy to provide you with references or any additional materials that might be useful. I’ve included my resume and hope to hear from you soon to discuss the job in more detail.